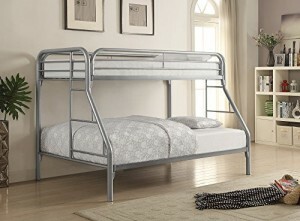 This Coaster Contemporary Twin-over-Full Metal Bunk Bed, Silver measures 78.5″ Length x 57″ Width x 59″ Height. Are you looking for a bunkbed that can accommodate children, teens, or adults of any age? This set features space for a twin mattress on top, and accommodates a full-size mattress on the bottom. The top bunk features a protective railing for younger children and is accessible by ladders on either side of the bed.